"You Can Attract the Man of Your Dreams -- and Receive a Marriage Proposal in 12 Months or Less!" By Bob Grant, P.L.C., "The Relationship Doctor"
Okay, are you done choosing the top 3 attributes or traits of your dream man? How long have you been waiting for your dream man to show up in your life? How long have you been waiting for love to find you? If you're like most women, from the time you were old enough to think, you've dreamed that one day your PrinceCharming would come along -- and he would sweep you off your feet, and you'd live happily ever after, right? But it hasn't happened -- and you're still waiting, aren't you? FACT: A study by The New York Times and the Census bureau has shown that more than half of the adult women in America are single. This is the first time in history that the number of single women in America -- 50 million -- has exceeded the number of married women. Imagine ... there are now over 50 million single women in America -- and the number of single women in other countries is just as staggering. But unfortunately, being in the company of millions of single women doesn't make you feel any less lonely or discouraged, does it? In my 17 years of experience as a Licensed Professional Counselor, therapist and relationship coach, I've found that marriage-minded single women who haven't found their dream man -- or haven't received a marriage proposal -- tend to have feelings of being worthless or defective with every passing day. Even if they try to appear confident and carefree on the outside, they usually hide a deep-seated feeling of isolation -- of being left behind. A single woman's fears, insecurities and loneliness are magnified whenever a friend or relative gets married -- and she still isn't married. Every time she sees a happily married couple, she is given the awful reminder that no man wants to marry her. She worries she'll never find Mr. Right, that she'll never be married -- or that she's doomed to a lonely, unmarried life. She even begins to wonder whether she should just settle for any man who comes around. Does this sound familiar? Perhaps you've felt this same pain yourself? What if I told you that I can help you easily find and attract not just any man -- but the man of your dreams -- and that I can guarantee he will propose marriage to you in 12 months or less? It doesn't matter whether you're a single woman who's never been married, or a divorced or widowed woman who wishes to remarry. Neither does it matter whether you're tall or short, shy or outgoing, thin or heavy, what your skin color is, whether you have children or not, or what part of the country (or the world) you live in. It also makes no difference how many times you've tried to find the right man and failed. When you follow my proven plan exactly as prescribed, you cannot fail to get the man of your dreams -- and more importantly, have a long-lasting and blissful relationship with him. Who Am I -- and Why Do I Get So Many Wedding Invitations? My name is Bob Grant. I'm a Professional Life Coach, #1 Amazon best selling author with 17 years of successful work with singles and couples in my private practice. I'm also the author of two popular books, The Woman Men Adore ... And Never Want to Leave, and How to Get Him Back. People call me "The Relationship Doctor" because I have the prescription for finding love, keeping passion alive, and reigniting relationships that have lost their spark. It always amazes me when women tell me "It's so hard to find a good man." On the contrary, I think it's really easy for any woman -- and that includes you -- to find not just any good man but your dream man -- if you know how. I'll tell you how in a moment. Year after year, I get the privilege of seeing many of my female clients not only have a wonderful man walk right into their life -- but also receive a marriage proposal within a short period of time. In fact, one of the most gratifying rewards of my practice is the number of wedding invitations I receive from clients! "Will I Ever Get Married?" A client of mine (whom I will call Susan) was 29 years old when she came to seek my help. She wanted to get married, but no matter how many different men she dated, none of them led to marriage -- and she was very frustrated. Initially, I had to make her realize that she was contributing to her problem by dating only men that were “exciting” to her -- and didn't necessarily have the qualities that were important to her. Was it any wonder that those relationships never ended up in marriage? It took Susan a few months to accept the fact that her dream man might not appear to be her dream man upon the first encounter. In the past, she had often dismissed most of her dates after just one encounter whenever she didn't feel that "instant chemistry" with them. I showed her a proven plan (see How to Find the Man of Your Dreams) that enabled her to zero in on the qualities she really wanted in a husband (instead of just the superficial qualities). She wanted a man to be strong, independent and caring -- which were qualities that none of the "exciting" men she used to date possessed. Over the next few months, her choice of men began to improve as she implemented the plan. Slowly, she realized exactly what it meant to listen to her heart -- and she finally met her dream man! 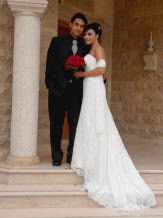 A few months later, I not only received a wedding invitation from her -- but she asked me to walk her down the aisle! 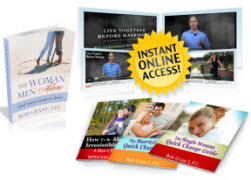 Over the last 17 years of counseling hundreds of real-life female clients, I have carefully observed women who have been able to successfully find, attract and marry their dream man -- as well as women who have not been successful. I made a very interesting discovery! I found out that the women who are not successful at finding their dream man have one thing in common. Do you know what it is? Check one below. B. They're very picky about men. -- A, B, C or D? The correct answer is none of them! ...you have an ineffective pattern regarding your relationships with men. Patterns don't lie. A pattern is a combination of behaviors, thoughts, emotions, actions, qualities and tendencies forming a consistent arrangement that generally brings about a predictable result. Just as there is a pattern in some teenagers that causes them to consume alcohol; a pattern in career people that causes them to find only bad jobs; a pattern that causes individuals to have anxiety in public speaking; so too, is there a pattern that causes women to be unsuccessful at finding their dream man or an ideal mate. This pattern, which runs on auto-pilot, usually beneath the radar of your awareness, makes you unconsciously sabotage your deepest desire to find love. The good news is that once you identify the ineffective pattern and replace it with an effective one, there is a very high probability that you will find, attract and have a successful relationship with the man of your dreams. Yes -- believe it or not, it's as simple as that! The problem that most single women have is that they don't know the difference between an effective pattern regarding relationships and an ineffective, self-sabotaging pattern. In fact, most women don't even know that they have a pattern in the first place! "Why do I always attract the wrong kind of men?" In February, Melissa J. wanted to quit dating altogether. She was 37, had been dating continuously since she was 16 -- and she was sick to death of the dating scene. In the last 21 years, she'd had two boyfriends that lasted more than a year, and the rest lasted only a few weeks to a few months apiece. She was so depressed because all her girlfriends had already gotten married and she was the only one who remained single. And yet she dreaded dating yet another guy because she believed that all men were jerks and all the good ones were already taken. She began believing the cruel joke that says, "It's more likely for a single woman over 35 to be killed by terrorists than to be married." While outwardly, Melissa maintained the attitude that there was something wrong with all men in general -- deep inside, she felt there was something wrong with her. "Why do I always attract the wrong kind of men?" she wondered. It was only after she became aware of her self-sabotaging pattern (see How to Find the Man of Your Dreams) that she was able to replace it with an effective one. Her new pattern created just a slight shift in her mindset -- and yet the results were incredible. Within weeks of changing her pattern, she had a string of wonderful eligible men competing for her attention. After dating a few, she quickly discovered that one of them, George M., was the real deal -- the man of her dreams! She began seeing George exclusively in May 2004 -- and on Valentine's Day 2005, 10 months after their first date, he proposed marriage and she happily accepted. If you're in a hurry, click here to discover how to find the man of your dreams now. Earlier on, I asked you to pick the top 3 attributes or traits of your dream man. Hopefully, you did that little fun exercise at the top of this page. Just because you picked the top 3 qualities of your dream man does not mean those are the things you want in a man. Now, I can almost hear you say, "Huh?" Let me explain. The top 3 things you answered are what you think you want in a man -- and not necessarily what you really want in a man. No wonder they can't find their dream man! There's a big discrepancy between the two. I'm sure you've known women who've gushed about finding their dream man -- saying he has all the things they've been looking for. And yet later on, they find out that their dream man turns out to be Mr. Wrong. Perhaps this has even happened to you? This all has to do with the ineffective pattern I spoke of earlier. You have an unconscious pattern of being attracted to an imaginary picture of an "ideal" man that, in reality, is completely wrong for you. What good is having a tall, dark and handsome man, for instance, if he's not good for you? What's the use of having a boyfriend with a great sense of humor if he also has traits that you can't stand? Would you want to be married to a romantic, sweet and affectionate man if he has issues that are intolerable to you? While it's impossible to find a man that is perfect in every way, you can find a man who has all the qualities that are truly important to you, and with whom you have the highest likelihood of being happy. I've found that when I've given women a simple exercise involving the traits of a man that truly matter a lot to them, they began to realize that the things they thought they couldn't live without weren't nearly as important as they thought. I'm sure you've known women who, upon meeting a man who did not seem to have the ideal qualities she wanted, ended up falling in love with the man and living happily ever after. Many such women admit that if they had not gotten over their petty ideals of male perfection, they would not have found the love of their life. Doe this mean you have to "settle" for someone who is not as great a man as you want to have? No, not at all. You never have to compromise what you absolutely must have in a man in order to get a man who is good for you. This is not at all like wanting a tasty filet mignon but getting a bland dish of steamed broccoli instead just because it's good for you. It's not at all like wanting someone as exciting as Rhett Butler in Gone with the Wind -- but getting someone like Amos Hart, the quintessentially boring, but adoring husband of Roxie Hart in Chicago. It's about getting a wonderful man with optimum qualities -- a man who is your most preferred choice based on what's really important to you. And isn't that the best definition of a dream man in the first place? If you're in a hurry, click here to discover how to find your dream man now. You Don't Have to Kiss a Lot of Frogs to Find Your Prince! If you're like most women, the process of finding your dream man might seem like a daunting task that requires lots of trial and error before you succeed. Believe me, I understand your dilemma because I've heard the same complaint countless times from female clients who come to me for counseling. Whenever you start dating someone new, you wonder, "Is he the one?" You hope he's the right guy so you invest a lot of time and effort in the relationship, only to see it come to an end -- usually with a broken heart or a lot of pain. It doesn't have to be that way. Finding your dream man is easy -- if you know how. I've put together a proven plan that will save you years of anguish in your search -- and put an end to the ineffective trial-and-error process of finding your dream man. The proven plan I've devised, contained in my new eBook, How to Find the Man of Your Dreams, is based not only on real-life feedback from dozens of my female clients, but also from time-tested strategies and techniques I've developed over the years. When properly implemented, I assure you that finding and attracting your dream man is only a few weeks or months away. When you get your hands on my e-Book, you'll be able to easily identify your ineffective pattern that keeps you from finding your dream man. I even make suggestions on behavioral changes, internal dialogue and positive constructive actions that replace your self-sabotaging pattern with an effective one. By simply using my proven plan, you will be amazed how effortlessly you'll find an endless pool of ideal men who are custom-tailored for you -- and who are also most likely to be mutually attracted to you and want to marry you. You will also learn the simple exercise I devised for my clients, which will enable you to discover a more accurate view of the type of man you want to marry (see page 55). This may not seem like a big deal because you think you know your type -- but this is truly eye-opening. This alone is worth ten times the price of the book. For my clients like Susan (above), it has made the difference between being unhappily single and happily married! who will love me for who I am?" Jennifer was 28 years old and just coming out of a divorce when she came to me for counseling. After years of living with someone who constantly berated her, she began to view herself as the flawed, undesirable person her ex-husband told her she was. Three months after the divorce, she began to develop a tremendous fear that she would never find a man who would love her for who she was. The first thing I did was to teach her how not to allow her fears to make her feel lonely, worthless or defective (see page 9 of How to Find the Man of Your Dreams), pointing out that the way she viewed herself was of utmost importance in finding a man who would want to marry her. Then, I guided her towards discovering what she really wanted in a man (see page 55) -- and equipped her to be prepared once he showed up in her life (see Chapters 5 through 7). At first, she did not believe the plan would work -- but she stuck with it anyway. After 5 months, she not only had a clear idea of what kind of man she was looking for, but this time she was also convinced that it would happen. Then one day, she met a man who seemed perfect for her -- except that he didn't satisfy one of the criteria she had established as her "non-negotiable" requirements in a man. She dared to remain true to her heart and not make compromises. Eventually, she ended that relationship -- even though she feared she might be making a mistake. A week later, she met a wonderful man at her church with all the qualities she wanted, including the fact that he was tall (which was important to her). They started dating, and within 9 months, they were engaged to be married. They sent me a wedding invitation that I keep in my drawer together with other invitations of all my clients whose dreams have come true. How Much Is It Worth to Find the Man of Your Dreams? Think for a moment of the amount of time it takes for you to plan a one-week vacation -- and the amount of money it takes to pay for it. It's quite a bit of both time and money, isn't it? And that's just for a vacation that will last one week of your life. By comparison, it surprises me to see the lack of planning women put forth into finding the man of their dreams -- when finding their dream man will affect their entire life! Finding and attracting the man of your dreams is something that you need to approach in exactly the same way you would approach any other important goal in your life -- with a plan. As I mentioned earlier, I've developed a proven plan which is featured in my new e-Book titled How to Find the Man of Your Dreams. What is the value of replacing your ineffective pattern regarding relationships -- and immediately having a pool of wonderful eligible men that you can choose from? How would your life change when you not only find and attract your dream man -- but also have an enduring and blissful relationship with him? What price can you put on not having to go through the tedious trial-and-error process of finding your dream man -- but instead having a step-by-step plan to effortlessly attract him into your life? What is the value of never feeling lonely or defective again -- and never fearing you'll end up with the wrong man? Clearly, the ability to find the man of your dreams is a priceless skill -- one that's worth at least the money you'd spend on a one-week vacation, don't you think? How much would you spend for a one-week vacation? That's less than half the price for a one-night stay at a deluxe hotel in any vacation destination! Your investment in this life-changing e-Book is just $47 -- which is just a small fraction of the $395 that I charge for a 45 minute counseling session, in which I could cover only a tiny part of what my book contains! Own "How to Find the Man of Your Dreams" today. I am so confident that you'll be overjoyed with the terrific results and lifelong benefits you get from following the plan I reveal in How to Find the Man of Your Dreams that I'm willing to have you try it at my risk. Go ahead and get your hands on How to Find the Man of Your Dreams today without risking a penny. Implement my proven plan and see with your own eyes how dramatically your life will change. If you don't absolutely love the life-changing information you'll find in my e-Book -- or if you're not 100% satisfied for any reason -- simply send me an e-mail within 7 weeks of your purchase, and I'll refund your entire purchase price. No questions asked! If you order now, you can get these programs at a STEEP discount. The Woman Men Adore advanced Video System. - You'll exactly what men find irresistible in a woman. With specific real life examples and practical tips and suggestions, you won’t have to guess about what to do. * Paige used the On button technique and suddenly her husband began asking her how he could help out around the house. * Cynthia realized that she had been using the #1 relationship killer on all of her boyfriends and by making 1 simple change married the next man she dated. -The temptations men face today are constant. -Hook up website, Apps that make affairs easy and even FACEBOOK. All of these tempt a man and put even the strongest relationship at risk. -Unless a man has an emotional BOND with you, he won't love you enough to resist all of those temptations. 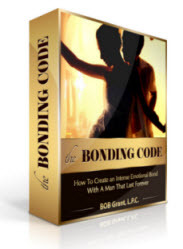 The Bonding Code will show you how to create this bond that will keep him devoted to you forever. There are 2 more suprise programs that total are worth $297. But I'll let you have them for only an additional $97. But this offer is only good if you purchase How To Find The Man Of Your Dreams. When Will You Find the Man of Your Dreams? Some women meet their dream man spontaneously -- by accident, sheer luck or providence. But I have to tell you ... this happens rarely. Then, there are those women who meet and marry their dream man by taking an active role and following a proven plan. I've seen this latter phenomenon happen with predictable regularity among my female clients. How about you? Would you rather wait for your dream man to fall into your lap by some stroke of luck -- or would you rather take positive, constructive action to compel your dream man to arrive at your doorstep? If you'd rather do it the old-fashioned way and wait for him to show up, then prepare yourself for a long wait. But if you'd rather pursue your dream man the way you pursue any worthwhile goal in your life -- that is, by following a step-by-step proven plan, then you simply cannot be without How to Find the Man of Your Dreams. Can you afford to waste any more time getting less than the complete happiness you deserve? For your sake, I certainly hope you take me up on my offer today. Otherwise, the months and years will pass you by and you'll still lonely, frustrated or desperate -- wishing for your dream man to come around. Let me ask you one final question: How would you feel if your dream man were to walk into your life, fall in love with you, marry you and promise you his undying devotion? Now you don't have to imagine what it would feel like but actually experience it for yourself. P.S. When you find your dream man -- as I'm certain you will -- please don't forget to send me your wedding invitation. I may not always have the time to attend every one of the many weddings I'm invited to, but I'm always thrilled to receive one when I've helped someone get engaged or married. Send the invitation to me at the following address: Bob Grant, P.L.C., 1640 Powers Ferry Road, Building 17, Suite 375, Marietta, Georgia 30067. P.P.S. I'm often asked the question: Can a woman with children find the man of her dreams? Allison was a tall, slender woman whose marriage ended because her husband told her that he was in love with another woman. Needless to say, she was so devastated and heartbroken that she could hardly function. To make matters worse, she had 4 children -- all under the age of 10. “Who’s going to want to marry a woman with 4 children?” she asked me. It’s a sentiment echoed by many divorced or widowed women with children. As we began to craft her future, I must say there were more trying days than happy ones initially. Yet, in spite of it all, she remained determined. After discovering exactly the type of man she really wanted, it became easier for her to take a chance on men in spite of the heartbreak she had previously suffered -- and without worrying about making a mistake. She also found it much easier to start dating again, although she initially felt apprehensive about it because she hadn't dated in ages. In less than a year, she met another single parent who had a young daughter that was the same age as her own son. Shortly afterwards, they began dating and I lost touch with her until 10 months later when she made an appointment to see me. She sat down in my office and extended her left hand to reveal a beautiful diamond engagement ring. She thanked me for showing her that in spite of all she had been through, she could still find her dream man.